Our newest addition, the Touchdown Fantasy Football Belt features the highest quality craftsmanship around. 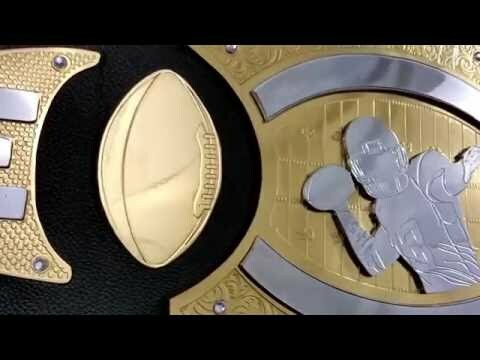 Celebrate your touchdown with this huge, custom championship fantasy football title belt today! This custom championship touchdown belt is a multi layer and stacked belt chrome and gold ! 1st of it's kind and the best of it's kind for fantasy football, or football awards and trophies to be upgrades. Touchdown fantasy football custom championship title belt is the absolute best in it's class. See attached, and prepare to make a statement with your new fantasy football touchdown award belt from ProAmBelts. 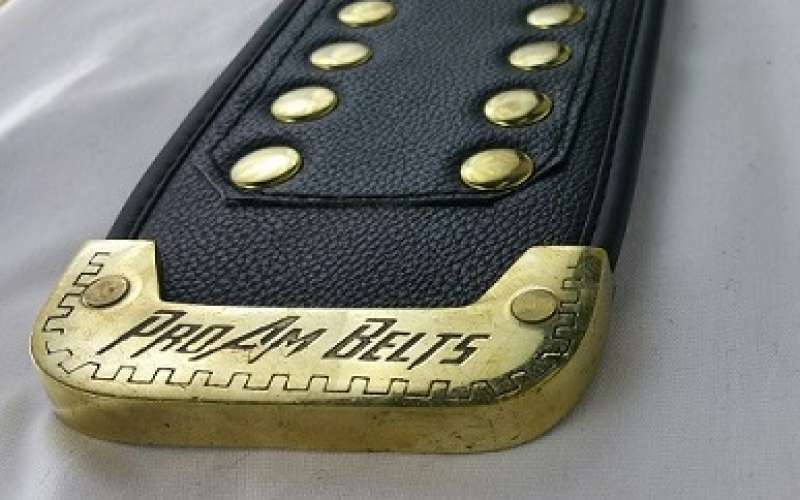 This is the premier of the premier stock belts we make, design patent pending, including all designs here at ProAmBelts. Nameplates can be removed and engraved if desired, contact us to customize this belt within the banners and nameplates with our premier vinyl technique wihch is quicker, easier, and more affordable for future upgrades as well. On the Touchdown belt, we can customize the top/bottom banners on the centerplate + sideplates with names/dates. Strap is about 53" in length with adjustable snaps, including a strap that looks and feel like a football! Only and originally from ProAmBelts. Nameplates can be easily taken off and reattached within seconds if you want to have it engraved locally OR we can customize those for you for with your league name and previous winners, just click contact us for a free layout! This product has been used also as a unique Touchdown trophy or award upgrade for leagues and accomplishments! I saw this online and couldn't believe my eyes. Most belts are way too over priced and horrible quality where this belt couldn't be more amazing. Everyone in my league can't wait to get their hands on it. If you want a belt for your fantasy football league, this is the one. Wow! When I saw this on their website I couldn't believe my eyes. I had to have it. Customer service was amazing because I had a little issue figuring out how to customize it. When it arrived I couldn't be happier. Anyone thinking about buying this belt, do it! Extremely high quality.